We are back with the biggest sneaker sale this month! 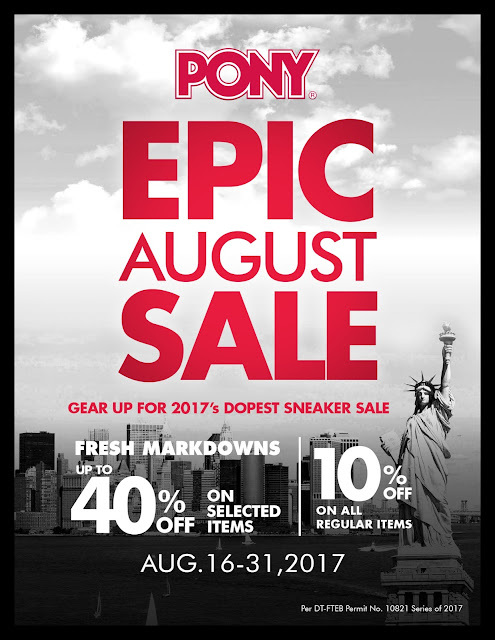 PONY is back at it again with a sale of epic proportions. Last year the NYC sneaker brand copped out an insanely awesome sale for the month of August. This year we’re going for a bigger and more epic sneaker sale. 2017 means larger discounts and more premium items to look out for. From the classic Top Star archive kicks to the fresh street-style collection of Shooters. From August 16 to 31, 2017 get up to 40% Off on selected items and exclusive 10% Off on all regular items. Cop these exclusive discounts at PONY.COM.PH, LAZADA.COM.PH/PONY and Department Stores nationwide. Get ready to grab a pair and #LetsGetItOn. Born and bred in New York. The year was 1972 when Pony challenged the industry giants and dominated the underground sneaker scene. Don’t miss out on fresh sneaker drops. Follow us on Facebook: PonyPH, Instagram: @pony_ph, and Twitter: @Pony_Ph.